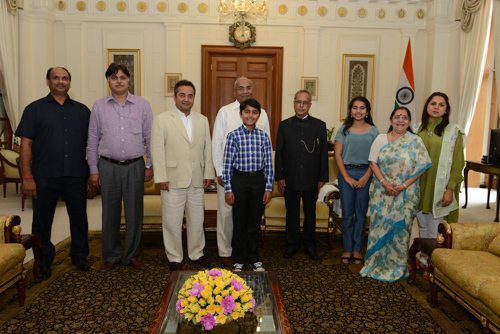 This past summer, Shivani (grade 9) and Mohan (grade 6) Awasthi had the opportunity to visit with India’s president, Shri Pranab Mukherjee, at his home in New Delhi. During the meeting the Harker siblings presented a bouquet of flowers to the president and addressed him in Hindi. They also told him about Harker and how much they enjoy attending the school. Mukherjee assumed office as the 13th president of India on July 25, 2012, crowning a political career of more than five decades of service in the country, working in both the government and parliament.